wow! Sue, the dolls are very cool! Sue - utterly brilliant! 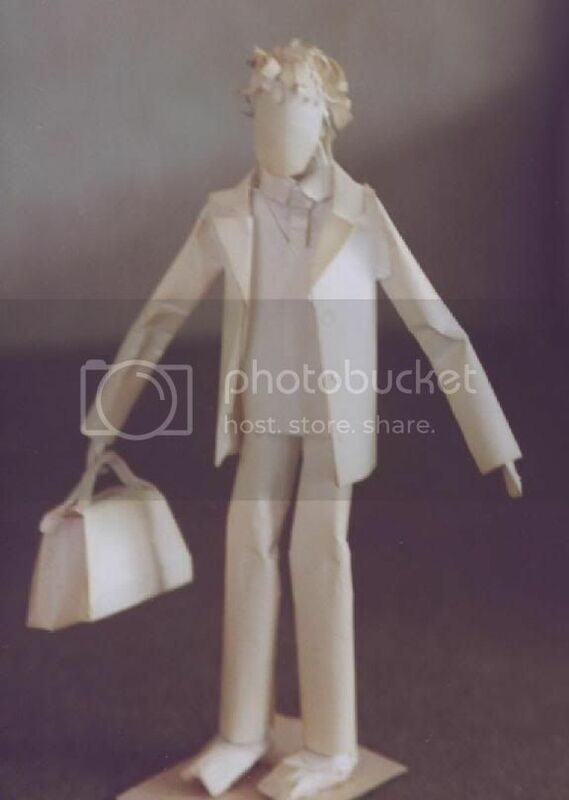 I never got to grips with paper sculpture - just not precise enough I guess. But those are just to die for! oh sue! the paper dolls! i LOVE these. they're entirely amazing. i don't know how you manage them. LOVE the artist. Thanks - the artist is one of the oldest - I was maybe 13 when I made that one. I think I need a hobby. is there anything you think you would like to try? Not really much help, am I? What about the bead bracelets and things you made? I think I'm after something a bit more challenging , but something I can do at home. For my birthday Karen gave me a fantastic craft book - talks you through a myriad of different craft projects, so you could try a few and see what you enjoy. I will let you have the book details in case it appeals to you. I do like the idea of making stained glass . Though I guess that's not a do it at home type thing. Might see if there are any workshops I can go and watch. It's a small but thick book which will not copy well (and I do hate broken spines on books), but I can certainly bring it along for you to have a look at - but why not just check out a few second-hand bookshops; there are always loads of craft books. I had a look in the Oxfam bookshop on Saturday, but they had nothing. I'll hunt around for a craft shop in London.